The Accounts & Users section of the admin portal allows you to bulk update email addresses for multiple accounts at once. The steps below outline the process for updating existing users email addresses via a spreadsheet template. Note - If you are using Google Apps for Education, and our Chrome web store apps, or just the Login with Google button to authenticate into the platform, you will be able to get right into the platform if your platform user account email address is using the same Google email address. Once logged into the Admin Portal, go to the Accounts & Users tab. At the top of your Accounts & Users section, you will see the "Bulk Upload" button. Before you click on the Bulk Upload button, it is recommended that you first export your list of Account IDs, which are required in the bulk update process. Your account IDs are the numeric identifier associated with each of your buildings listed in the admin portal. To export your list of account IDs and names, use the "Export Account List" button, located in the top right of your Accounts & Users section. This spreadsheet will return a list of all buildings in your account, with their corresponding Account ID numbers. If you only have one building, you will only see a single row in this export. The bulk user email update template is located at the top of the Bulk Upload window. To download the template, click on the Bulk Upload button. The bulk user email update template contains the following columns. Account ID (required) - Found in the Export Account List spreadsheet. This is the numeric identifier for each building and required for each user updated via bulk. You may bulk update as many different users, tied to any number of different accounts as you wish. The account IDs listed in your template must be listed as child accounts under your parent account or they will not be processed. Account Name (optional) - The text name of the account/building the user should already be tied to. This field is optional, and ignored by the bulk upload process. It is purely for reference only as you create your template. 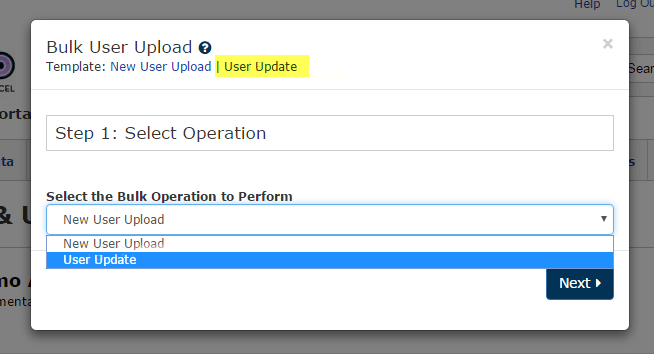 If the Bulk User Upload window is not open, click on the button again and select User Email Update in the drop down, and click Next. Click the Browse button to locate the saved template on your computer and attach it. Click Upload to start the upload process. You will be presented with a system processing message while the system is working. This pop up window will close after 8 seconds, but your spreadsheet will continue to process in the background. Once the upload process is complete, your browser will automatically download a new spreadsheet containing the results of your upload.